None of the above! It’s a Madagascar hairy land crab! 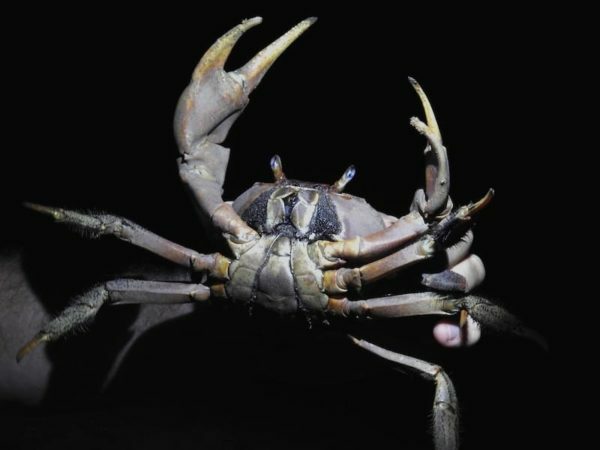 These hairy land crabs live in mangroves, digging holes in the ground until they reach water-drenched mud. That’s where they rest during the day. But at night they emerge, making creepy little alien noises as they scurry about, hunting for prey. And to be fair, they’re not that scary looking. At least not when your guide says, “Hey, over here! I found a hairy land crab,” and you know to expect something huge and sinister. But when you’re hiking through the dark forest at night and you walk past what you think is an empty hole in the ground, but your flashlight beam catches on an arthropod the size of a small cat waving its numerous spiny appendages in your direction and your heart skips a beat because what is this thing, well … I, for one, will understand if you scream.